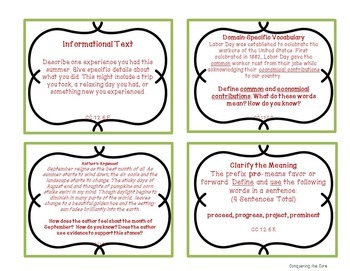 These task cards were designed to help include CC standards in your daily instruction. Often, we get so wrapped up in covering the standards that we lose sight of what we were teaching in the first place. These task cards give you a way to carry-on with instruction knowing you’ve touched on an important standard for the day. It is frustrating when my class is heavily involved and interested in a good novel and I have to stop to think if I’ve covered every standards possible. We just want to enjoy reading! This is all part of conquering the core! These can be used as a daily bell ringer, an independent task your students can complete while you work with individual or small groups of students, or as part of your daily Common Core instruction. The task cards touch on a variety of standards including Literature, Informational Text, and Writing. 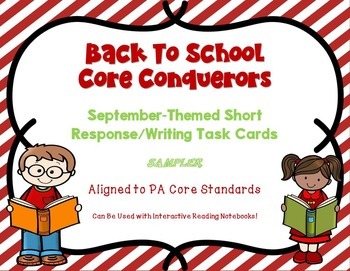 These are specifically aligned to 6th Grade PA Core Standards, but address Common Core Standards across upper elementary and middle school grades. If you like these 8 task cards, be sure to purchase the set of 20.